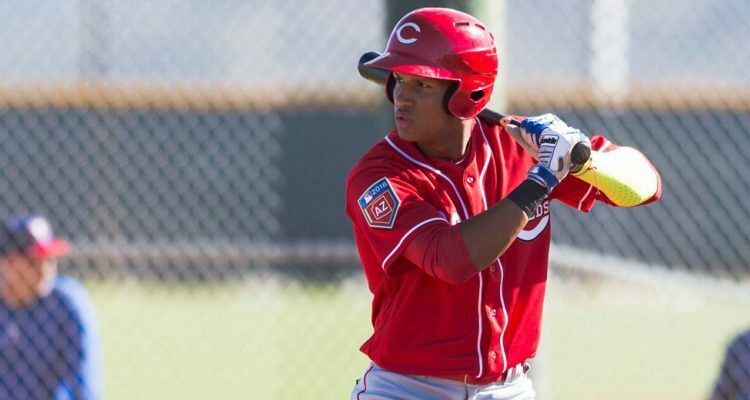 The Cincinnati Reds signed Danny Lantigua in June of 2016 out of the Dominican Republic. 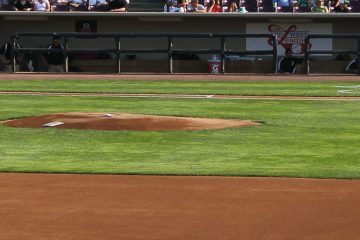 He didn’t take the field until the final day of July in 2017 as an 18-year-old with the DSL Reds. He had limited playing time during the year, playing in just 17 games down the stretch. The switch-hitter hit just .200/.250/.317 in that span with 4 walks and 22 strikeouts. 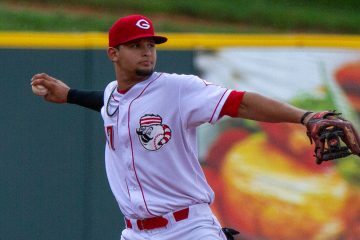 The production in limited action in 2017 didn’t stop the Reds from believing in Danny Lantigua. 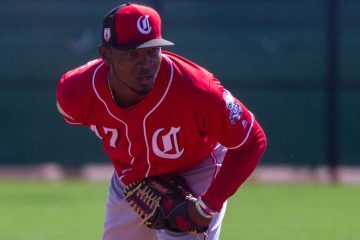 Cincinnati brought the 19-year-old stateside in 2018 and played him nearly every day with the Arizona League Reds. The season got out to a quick start for Lantigua, who homered in the first game, tripled in the second, and doubled in the third. Before the first week of the season was over he added to more doubles and another triple. He didn’t slow down much in the final week of June, either. In 11 games played during the month he would hit .279/.319/.605 with 8 extra-base hits, 3 walks, and 12 strikeouts. July did not pick up where June left off for Danny Lantigua. Over the first two weeks of the month the power showed up. He homered three more times and added a double in nine games played. But the outfielder also struck out 15 times without a walk, hitting just .222 along the way. The second half of the month was more of the same. In the final 13 games of the month he had six extra-base hits, but 16 more strikeouts and hit just .191. He would finish the month with a .205/.230/.446 line that included three walks and 31 strikeouts in 87 plate appearances. After starting 0-3 with a walk to kick off August, Danny Lantigua caught fire over the next four games, going 7-19 (.368) with two doubles and a triple. But, he went into a slump, going 0-11 in the next three games before catching fire once again. From the 13th-18th he hit .400 with a triple, two home runs, and three walks – OPS’ing 1.433 in that stretch. The season ended with a big slump in the final week of the season where he would go just 2-23, with both hits being doubles. In 81 plate appearances during August he would hit just .211/.296/.408. He more than doubled his walk total on the season, drawing seven free passes. His strikeout rate, though, remained sky high as he fanned 32 times during the month. Hitting | The current tool that needs the most work, Lantigua’s got a below-average hit tool in the future. Currently his lack of contact ability doesn’t allow him to get much from this area of his game. Power | This is where he stands out both now and in the future. There’s pop in his bat in games today, and he’s got plus power in the future to tap into. Speed | He’s currently an average to fringe-above-average runner. He is expected to lose a step as he fills out his frame, though. Defense | While he currently can handle center field, his speed is ultimately going to move him to right field where he can be an average fielder. Arm | Another big tool in his arsenal, he’s got a plus arm that will play very well in right field in the future. With Danny Lantigua there’s a lot of risk. He’s a guy who hasn’t made it out of complex level baseball with huge strikeout rates. His strikeout rate is going to absolutely have to improve moving forward if he’s going to make it out of A-ball, much less to the Major Leagues. But when it comes to tools, he stands out on the field. He’s a switch hitter with plus power from both sides of the plate who could be a strong defender in the corner outfield. In a perfect world he would be able to remain in center, but that’s a very long-shot proposition. He kind of represents the true boom-or-bust caliber prospect. The upside is there to be a 30 home run switch hitting, strong defender at the Major League level. But the strikeout rate and hitting concerns are also there that could mean he struggles to handle pitching in A-ball. We’ve seen players with similar issues overcome them in recent memory. Jose Siri had 64 strikeouts and just 3 walks for the AZL Reds at the same age in 2015. He made adjustments over the next few years and has held his own, and more at times, in the levels he’s played at ever since. Time will tell if Danny Lantigua can do the same. 434 Feet on August 18th. He slugged .649 in 63 plate appearances against younger pitchers in 2018. He slugged just .393 against older pitchers in 152 plate appearances in 2018. I’d assume he plays in Greenville this year. If the K rate improves maybe move to Billings and a shot at Dayton in 2020, but that 34.9% K rate makes me skeptical we ever see him above rookie ball. Assuming he fills out (which in turn would only help his power) he seems like a prototypical RF. 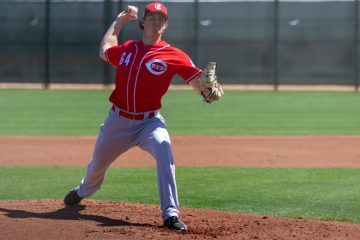 Last winter I predicted that this year’s prospect class would be the best in Reds history. Using the Fangraphs rating system it was determined as of November it was the second best to last year’s class. The pre-2018 class had a ranking of 326. The pre-2008 class had a ranking of 264. The pre-2019 class had a ranking of 296 in November. Had it not been for the downgrades of Greene and Siri the pre-2019 class would have had a ranking of 329 in November. The Reds have lost 4 prospects thus far this winter and now have a value of 253, third behind the classes mentioned above. 2. Greene 50 (this winter), 55 (last winter) to 60 (top 20 prospect). 3. India and Santillan 50 (this winter) to top 50 overall prospects and 55. 4. Siri from 45+ (this winter) and 50 last winter, back to 50. 5. 1st pick 50 rating (I have the Red drafting a pitcher because pitcher values are lower). 10. 5 40’s on both offense and pitching vs. 7 offense this year and 6 pitching this year. Aggressive upgrades: Siri back to 50, Richardson and Garcia from 40+ to 45, Thomas from 40 to 45 and Santana, Diaz and Salvador to 40+. Conservative grades: Greene and Trammell at 60 because I feel one will be a top 5 prospect and a grade of 65. Siri at 50, Thomas and Bautista at 45, Santana, Diaz and Sanmartin at 40+, Beltre, Hernandez, Clementina and Sugilio at 40, and just 10 40’s. Some players are on both the Aggressive upgrades list and the Conservative grades. If Siri hits like he did the last month and a half in winter league, I could see him being a top 50 prospect with a grade of 55. But if he hits like he did last summer he could be a 45. If Thomas takes to catching as I have heard they are going to try him at then I could see him at 50 if he continues to hit. But if he stays at 1B then 45 is aggressive. Newcomers: Beltre, Sugilio, Clementina, Marian and Heatherly. Best in Reds history? Not sure about that. 1965 prospect list: Johnny Bench. Hal McRae. Lee May. Tommy Helms. Bernie Carbo. Just to name the Top 5 Reds prospects that year. Others on the list, too. Lets start with Bernie Carbo. Just drafted. The Reds finished in 2nd place in 1964. He was not selected 5th like India. He hit .188 in Rookie ball. His ISO was 0.048. His slugging % of 0.236 would stick as a BA let alone a Slg %. Big time name (mostly because he was selected before Johnny Bench) but he was not a prize prospect at that time. Maybe a 45. Maybe a 45+ but no higher than that. Bench was a 2nd round pick. His ISO in 1965 was nearly twice that of Carbo but still a very low 0.086. At least his Slg % was .332. Let’s put him equal to Gray/Richardson at 40+. Lee May had a great season in AAA. Let’s assume he was a 6-20 prospect even though he spent another year in the minors. Tommy Helms was nothing more than a role player and his .750 OPS in the minors shows this. Shed Long is a good comparison. Give him a 50. Hal McRae was drafted in the 6th round in 1965. He absolutely stunk in 1965. .154/.203/.200/.403 Safe to say he was not even on the radar at that point. If these are the 5 best prospects in 1965 then rest assured this class stunk. Things were different back then Old Timer and of all people you should know that. Bench was drafted in 1965 and in the majors in 1967. Gary Nolan was drafted in 1966 and was in the majors in 1967. The good prospects did not stay in the minors long because there was no 6 years of control. The only prospect from the post 1965 season that was in the majors by 1967 is Lee May and Johnny Bench. I did not spend a lot of time looking prior to 2000. But the prospect classes from 1960-1980 were much thinner than the ones of today because teams did not have to worry about losing control of players like Bench and Nolan in their peak years in return for minor roles at the age of 19. The Reds MilB system in the 1960s produced HOF players, multiple All Star players, and many 10 to 15 year career MLB starters. Some with the Reds. Some with other teams. 1960s Reds farm system was MUCH better the current one. MUCH. Tommy Helms a role player??? ROY in 1966. Multiple year All-Star, multiple GG winner, starter for Reds AND Astros. Role player??? PS he averaged over .300 in Reds MilB system. Outhit Rose at Macon in 1962. A couple more things. In mid 1960s there was no free agency at all. There were INFINITE years of control. Free agency started in mid 1970s. Hal McRae. 19 year MLB player. Excellent hitter for KC Royals (averaged .290 for his career). Multiple year All-Star. Won Silver Slugger. Among the best DH of his time. Struggled in A ball but had 3 solid years in 1966-67-68 in Reds MiLB system. Reds fans of today have no connection to the good Reds teams of the 1960s and the great ones of the 1970s. PS Johnny Bench (best C ever) ALONE makes the 1965 Reds MiLB prospects better than the current ones. Oldtimer, in the mid-60’s everybody’s system looked a lot better as there were only 16 teams to distribute the talent to while today there are 30. So it really is not comparing apples to apples. So in comparison now could be much stronger and have less successful future big leaguers. Tommy Helms was a role player. For the Big Red Machine Cesar Geronimo and Dave Concepcion played a role. Sparky did not care about the offense. Their “role” was defense. Concepcion actually became one of the Reds better hitters in the 80’s so I will focus on Geronimo here. After acquired in the Tommy Helms trade, Geronimo had an OPS north of .700 four times in six year and in 1975 he was close to .700 at .690. Over those six years his OPS was .720. And he was not starting because of his offense. Tommy Helms never had an OPS over .700 in his career. In fact Tommy Helms’ line with the Reds was .269/.297/.339/.635. For comparison sake Billy Hamilton’s line with the Reds was .245/.298/.333/.631. As for the minors you are wrong. Tommy Helms had a lifetime .291 BA in the minors. I will give you that he did have one good year in A ball where he outhit Pete Rose. But the Reds must have felt Rose was the better player because Rose was starting in the majors the following year and Tommy Helms spent 3 more years in the minor leagues. So yes Tommy Helms was nothing more than a role player. That is not bad. He played in the majors. Cesar Geronimo was a role player and he has two rings to show for it. I will give you that the 1960’s classes as a whole are better than the 2018 class. But that is not how it is done. In the three years after 1965 the only players to come up through the Reds Farm system were: Tommy Helms in 1966, Lee May and Gary Nolan in 1967 and Johnny Bench in 1968. In 1969 no players exhausted their Rookie status and in 1970 Bernie Carbo, Hal McRae, Don Simpson and Don Gullett did. Of the 8 players who cam through the minors 5 were the one’s you brought up as your great class. The other three Gary Nolan (drafted in 1966), Wayne Simpson (1967) and Don Gullett (1969) were in High School in 1965. So the 1965 Prospect class consists of 5 players who had an impact. Three of these 5 were in rookie ball because they were drafted in June of 1965 and hence difficult to give stellar ratings. One was destined to be a role player and could never get a high rating. That leaves Lee May who was a 1B so he needed the big bat. All in all a weak class and not worth mentioning. You make a good point MK about there being only 16 teams so the Reds were getting two picks in the top 30 back then. But this is countered by the fact that there were fewer teams so fewer prospects had opportunities to make it to the majors. The times actually made it difficult to develop the quality farms we have today. There was no free agency so teams were not concerned about starting the clock. Gary Nolan was drafted in 1966 and playing in the majors in 1967. Don Gullett was drafted in 1969 and playing in the majors in 1970. Players were drafted one year and playing in the majors the next. Jim Maloney was in the majors at age 20. Wayne Simpson was in the Majors 2 years after being drafted. Johnny Bench took forever. He spent 3 years in the minors. Currently the Reds have five 1st round draft picks that qualify as prospects. Last year the Reds had five 1st round draft picks that qualified as prospects. Bernie Carbo was the only 1st round pick in the 1965 class. In 1970 Gary Polczynski was the only 1st round pick that was a prospect. Times were different and prospect classes were much thinner. Just looked it up. In Hamilton’s 5 years with the Reds his WAR was 10. That is 2 per year on average. In Tommy Helm’s six years with the Reds his WAR was 4.3. That is .7 per year on average or roughly 1/3 of Hamilton. Hamilton was allowed to walk even though the Reds had another year of control. To think someone would toot the horn of a player one third as productive as a star. His offensive WAR as a Red was -104. Sounds a lot like Aquino. Aquino broke out at Billings in his age 20 season, so maybe Lantigua can do the same this year. Why are all of these columns titled “Top Prospects” when that’s rarely the case? It’s the name of the series. And really, when there are 250 guys in the organization, and I write these on about 50-75 guys, they are the top guys. The Top Prospects series is from the group of guys just outside of the Top 25. Doug, who were the award winners from instructional league? Danny Lantigua numbers make him very thin and should really be able to pack on some muscle. Looks like the Reds are done making moves this offseason. They have to make a roster move to clear a spot for Duke. I think they’re still trying to finalize a deal, even if it’s not the Realmuto trade.